Scott Tallon Walker (STW) the UK and Ireland based architectural practice, will finish work on the 34,500 sq m Cancer & Surgery Facility for University College London Hospital (UCLH) in 2020. This is the second of only two NHS High Energy Proton Beam Therapy services. The central London hospital project designed in association with Edward Williams Architects, necessitated STW to achieve BIM Level 2 certification. The firm was awarded its BIM Level 2 citation at a ceremony in London on 14th February 2019. BIM is a mandatory requirement for all large projects in Britain and Northern Ireland that are publicly funded. Though not yet mandatory in Ireland, it has been recently recommended by the Office of Government Procurement (OGP) for complex projects including hospitals and Third Level institutes from Q2, 2019. The use of BIM (Building Information Management) will reduce risk, improve performance and eliminate costly waste by virtually building and testing designs before they go to site, something that is particularly relevant in the current climate. With offices in the UK since 1974 Scott Tallon Walker has won many high-profile public sector design briefs there. As well as the ongoing UCLH project STW has very recently completed the Queens University Belfast School of Biological Sciences, and two projects at the University of Surrey – Innovation for Health and 5G Innovation Centre. STW will also complete the Trinity College Dublin Business School project in March 2019. We realised early on that to grow our practice further that we would have to be at the forefront of technological accreditation, so I’m delighted for all our staff, across our offices, that they have achieved this extremely high standard. I’m pleased to note as well that BIM Level 2 will shortly be introduced as a standard in Ireland and it should help in curtailing spiralling building costs, that have been so much in the news recently. The 34,600m2 facility is currently under construction in the heart of London at Grafton Way, next to University College of London Hospital, on Tottenham Court Road. When completed, it will offer a world-leading new radiotherapy to patients, which targets tumours more precisely. The Design has been assessed as BREEAM Excellent and is a UK Government Exemplar Project for the use of BIM Level 2. In line with the Government Construction Strategy and the requirement to strengthen the public sector’s capability in BIM, the building is being developed as a collaborative Level 2 BIM project which provides an enhanced level of coordination while adding considerable value through the design process. This project is currently under construction by BAM who are a leading contractor in Ireland who are committed to implementing Level 2 BIM standards rigoruously on their projects. STW are working closely with BAM to ensure that design and construction deliverables meet or exceed standards. Scott Tallon Walker Architects are currently working on BIM projects both in the private and public sectors across a range of project types. A successful BIM projects starts with employer/project information requirements which are then translated into a BIM Execution Plan which is an important document that ensures all project team members are aligned in producing information that is coordinated and meeting client information requirements. Scott Tallon Walker Architects would be delighted to speak and share some insight with anyone considering procuring their next building using Building Information Modelling based on industry standards. This entry was posted in BIM, Newsletter Ireland, Newsletter UK on February 14, 2019 by stwarchitects. Scott Tallon Walker Architects are pleased to announce that they have been recommended for certification for the design and construction of BIM Level 2 projects in line with PAS 1192-2 by the British Standards Institute. BSI developed the BIM scheme for PAS 1192-2 Information management for the capital/delivery phase of construction projects to help designers and contractors, as well as their supply chains, provide evidence that they have the capability to deliver projects using Building Information Modelling (BIM). STW successfully demonstrated that they adhere to the requirements of the PAS 1192-2 standard through an independent assessment by BSI of our documented procedures and systems for all processes in PAS 1192-2, including compliance with BS 1192 and BS 1192-4, and the competency of our staff. This entry was posted in Announcements, BIM on December 11, 2018 by stwarchitects. Here is an Insight into the delivery of University College London Hospital’s (UCLH) cyclotron for their new Proton Beam Therapy facility in London and what it means for British citizens to have this facility available to NHS patients in the UK. This ground-breaking facility is on track to treat patients in 2020, with the successful installation of the Cyclotron, the beating heart of the Proton Centre. 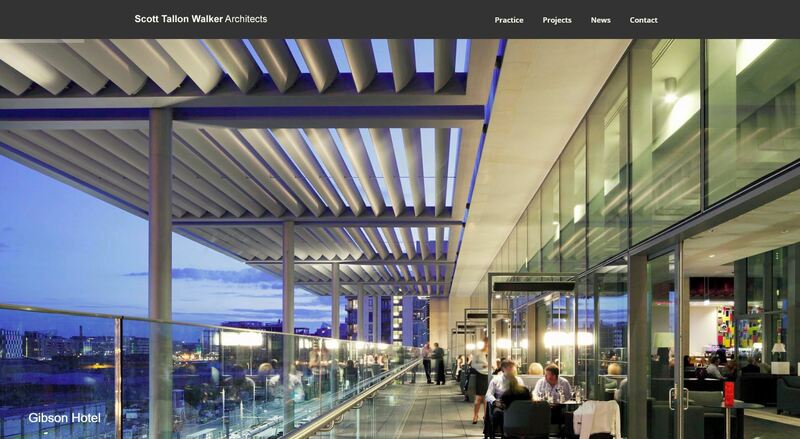 Scott Tallon Walker are proud to have been a part of this from inception to completion. Click to see Channel 4’s Coverage on the Proton Beam Cancer Therapy. This entry was posted in Announcements and tagged Cancer Research, Cyclotron, Healthcare, NHS, Proton Beam Therapy, UCLH on September 11, 2018 by stwarchitects. The proposal includes a 220-bed 4 star hotel, incorporating a 12-storey cylindrical tower on this very prominent and important site on Sullivan’s Quay, on the south bank of the south channel of the River Lee, overlooking the Grand Parade. The hotel development, which includes 2 levels of underground car parking, a bar, restaurant and retail area, as well as a gym and 11th floor viewing lounge, will be built alongside a new six-storey office development of c. 8,000 square metres. BAM acquired the site from the Revenue Commissioners in 2006 and had initially obtained planning permission for a mixed-use hotel and office development in 2009, also to Scott Tallon Walker’s design. The current proposal has brought the hotel use to a more prominent location on the site, to occupy the landmark cylindrical tower. The Cork City Architect has described the revised scheme as improving on the proportions of the design and making for a more elegant proposal. This entry was posted in Announcements and tagged Planning on June 29, 2018 by stwarchitects. Congratulations to Katie Oliver in Scott Tallon Walker Architects who as part of the university team at the London School of Architecture – Metabolic City – were highly commended for our submission for the Architects for Health award in the DIP Arch category. Our aim was to act as urban doctors, dispensing preventative design medication integrated into the natural flow of our experience of the city organism. The Architects for Health Student Design Awards 2018 took place in the Wellcome Collection. The London School of Architecture ‘Idencity’ Exhibition is in the Roca Gallery and is on display until the end of July 2018. This entry was posted in Announcements and tagged Awards, Healthcare on June 29, 2018 by stwarchitects.